I love pinning. Pinterest is my time filler of choice. When I first started using Pinterest two years ago I was looking for gift ideas for my kids, a task that seemed never ending. How many presents do they actually need? We would end up with piles of presents every Christmas, from us (parents) from grandparents, great grandparents, aunt, and countless others. Every year I couldn’t think of enough things they wanted for all of the people who wanted to buy presents, and then I found this little nugget on Pinterest. I remember thinking “This is genius! Where has this been all my life?” And so a new family tradition has begun, and I can’t sing its praises enough. I was worried that the first time we tried it (Easter) we would have some push back, but really both of my boys really enjoyed it. Here are some reasons why it works so well for us. 1. Limiting the amount of gifts. Four, that’s it. Sometimes I really want to buy more, because I get swept up in the excitement of it all, but this helps keep some perspective on how much we really need for each kiddo. 2. Keeps expectations in check. The boys know what they will get, something from these four categories. They also know that the only thing they really get any input on is the want category. My older son (AJ) told me this past week “you know I never really like my wear. I mean, I know its not my want… but still”. However, does he wear what I get him? Yes. And does he complain? No. This also keeps the “I want I want I want” way down at our house. They might tell me four or five things they want, but they know they need to narrow it down, because they are only getting one of them. 3. Teaches Prioritizing. We know at our house that if we only get one “want” then we’d better weed out what is really unimportant. My older son spends lots of time researching what he wants online, to find out what the best thing will be. Sometimes this helps him find out that he doesn’t have the correct equipment to run something he wants, or he finds out that he would need to replace the batteries so often that it wouldn’t be a good use of his money. This teaches skills I want him to have for the future when he spends his own money. 4. Extra $ for others. Because we don’t spend as much on our own gifts, we have extra money for gifts for others. In our church a Sunday School class sponsors gifts for children from the Center for the Prevention of Child Abuse. This year we purchased a remote control truck for a 3 year old boy. Both boys contributed their own money for the truck, and AJ (who has been tithing longer than his brother) saw this as a natural extension of what we already do. My younger son (CW) had a little trouble parting with his money, but we talked about how this little boy should have his own want, need, etc. He still wasn’t thrilled, but he understood that other people deserve a “want” as well. 5. Family giving made easier. Because the boys are good at narrowing down their want lists, it has become easier to tell family what they might like. I know which “want” I’ll give them, and I can let them know the other ones they requested. 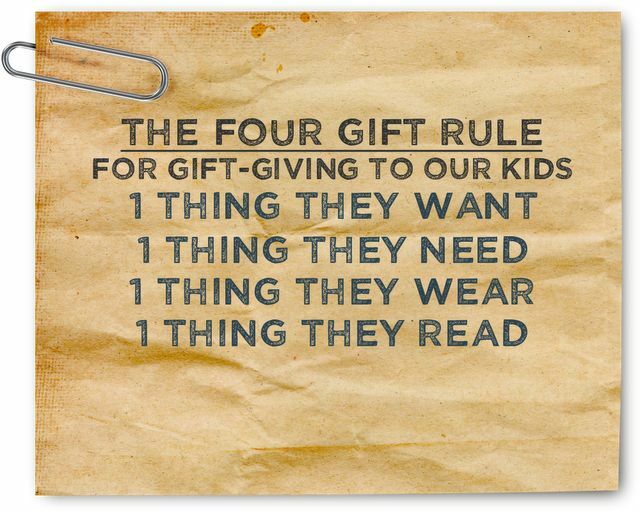 This has also simplified our family events, because family knows that we only give four presents, and we request they limit theirs to one big present, or two small ones. This has made our family giving times focus more on being together and less on the gifts themselves. I have really enjoyed these more simplified holidays these last few years. My prayer is that my boys understand what we are trying to do as they grow older, and grow to be generous and cheerful givers. May your Christmas season be filled with joy, and simplicity.